A fish farm caught on film with lice-infested salmon has been reprimanded by the Scottish Government – but the move has been damned as “truly pathetic” by critics. Marine Scotland fish health inspectors visited Vacasay fish farm on Loch Roag off the isle of Lewis on 5 September. 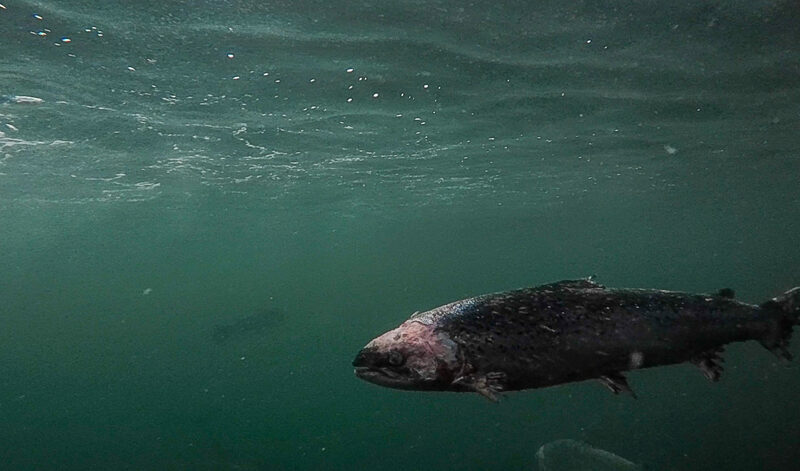 The inspection came two days after The Ferret published underwater footage of scarred and frayed salmon being eaten alive by hundreds of sea lice. Inspectors have now issued the firm that runs the fish farm, The Scottish Salmon Company, with an “advisory letter” saying that the number of adult female lice per fish had breached the agreed limit of eight for a month. “If The Scottish Salmon Company intend to continue to farm fish at the Vacasay site, they are advised to undertake a documented review, taking veterinary advice where necessary, of the current measures in place for the prevention, control and reduction of parasites,” the letter said. But the campaign group, Salmon and Trout Conservation Scotland, has condemned the letter as “woeful”. The footage of caged salmon in distress at Vacasay was “appalling”, said the group’s solicitor, Guy Linley-Adams. “Marine Scotland’s advisory letter in response is truly pathetic. It requires nothing of The Scottish Salmon Company,” he said. Don Staniford from Scottish Salmon Watch, argued that the company’s licence to operate in Loch Roag should be revoked. “This is wholly unsatisfactory,” he said. According to Staniford, 82 fish farms exceeded lice limits in 2017. “Fish health inspectors should visit all salmon farms reporting lice breaches and force rogue operators to comply with the law,” he said. He is due to launch a crowdfunding campaign to fund a legal action against salmon farms for breaching animal welfare law, under the banner “Stop suffering and cruelty on Scottish salmon farms”. The photographer and fly fishing guide who shot the film at Vacasay, Corin Smith, argued that Marine Scotland’s letter shows how weak regulation was in Scotland. He called for the release of all weekly sea lice data for the fish farm in order to restore trust. The Scottish animal welfare charity, OneKind, hoped that the advisory letter would ensure that the suffering of fish at Vacasay ended. “This case must act as a reminder to the Scottish Government that standards need to be improved across the board before the plans to expand the salmon farming industry go ahead,” said campaigner, Sarah Moyes. Scottish Labour’s environment spokesperson, Claudia Beamish MSP, has been calling for changes to the law to enforce the release of real-time data on lice numbers at individual fish farms. “The need for such an advisory letter is shocking,” she told The Ferret. The Scottish Government pointed out that inspectors had visited farms in Loch Roag on 7, 8 and 13 August to check on lice levels. An additional visit was made on 5 September “following reports of welfare concerns”, said a government spokeswoman. The Scottish Salmon Company stressed that fish health and welfare was fundamental to responsible salmon farming, but pointed out that operating in the natural environment brought unique challenges. “Sea lice are endemic in the wild and the extraordinary warmer water temperature this summer increased the sea lice challenge, as seen in Loch Roag,” said a company spokesperson. The company facilitated an inspection by the Scottish Society for the Protection of Cruelty to Animals (SSPCA). “They confirmed that they were wholly satisfied that as a company, we are taking all possible steps to protect the welfare of our fish and effectively deal with the naturally occurring issue of sea lice,” the spokesperson added. The Animal and Plant Health Agency (APHA) also visited Vacasay and found that the actions required were already in place. “The Fish Health Inspectorate visited the site and also found that the company was taking appropriate measures to reduce the numbers of sea lice in accordance with the site specific lice management procedure,” the spokesperson continued.